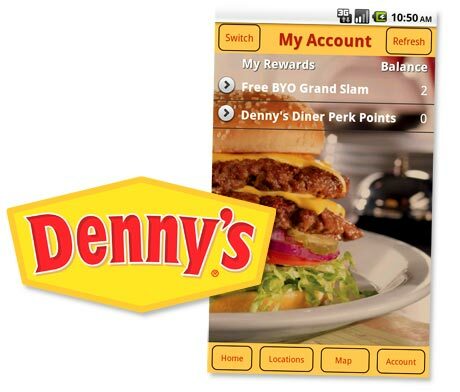 US family restaurant chain Denny’s is piloting a mobile rewards program that lets diners use an iOS or Android app to collect a point for every dollar they spend. The trial is taking place at restaurants in Seattle, WA and Buffalo, NY. To earn rewards, diners use their mobile app to check in to a participating restaurant on arrival and receive a code that they then present to their server. This is then entered into the restaurant’s POS terminal to link the amount of their purchases to their rewards balance. Once they have earned 100 points, they receive a US$10 credit. For the pilot, customers are also being offered a free ‘build your own Grand Slam’ meal when they download the app. Participants should also “look forward to surprises, offers, special promotions, and more,” Denny’s says. “It is crucial that we engage and communicate with our guests in a meaningful way that enhances their experience each time they walk through our door,” says Erik Jensen, director of advertising and merchandising for Denny’s. “Working with Paytronix Express Pilots has enabled us to quickly and efficiently roll out a test program, Denny’s Diner Perks, that will help identify and analyze our guests’ dining habits and needs, through targeted reward structures and messaging strategies to see what resonates best with them.